Just another look from Gwynnie Bee. 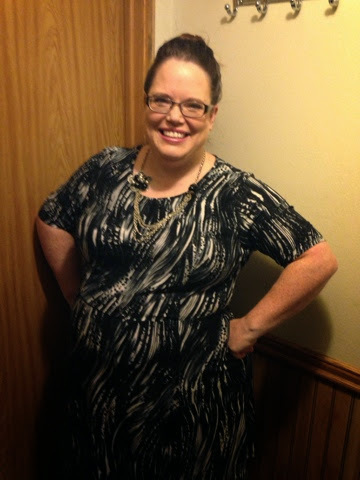 I FINALLY got to leave the house yesterday and decided to wear this Gwynnie Bee dress. I paired it with a chunky necklace I had (got it A Side of Peaches). You cannot see, but I also paired it with black leggings (I need to tell my husband to snap one of the legs and shoes too), and Uggs (because I have a boot on still from my surgery on one foot). This Conte Art Printed Fit & Flare Dress from Triste was comfortable and fit well. I actually got quite a few compliments about it too. My husband said it looked like something that I just got out of my close though(which is completely true), so I returned it. I have TONS of black/ gray/ tan in my closet. It is my basic go-to color pallet, so even though this is something I would wear all the time, I want to stretch those clothing boundaries a little. Which is what is great about Gwynnie Bee-- getting me to wear more fun clothing without commitment!